Without interruptions and distractions of soccer practice, television, homework, the Internet and telephones, it’s amazing what families can learn about each other. Escaping on an outdoor adventure allows families to get back to basics and the core of relationships. Away from 21st century inventions and activities, children and adults find commonalities in relaxation and recreation, while also having the individual freedom to explore and discover. 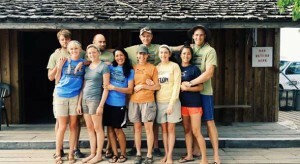 Holiday Expeditions is adept at outdoor family adventures. A family-owned and -operated business, Holiday believes that, “a family that floats together, sticks together,” and has built a solid business on this very concept. Every year, Holiday hosts more than 4,000 guests who find relaxation, freedom and discovery on rafting, biking, ranching and sea kayaking trips. Most importantly, Holiday gives families the opportunity to come together and enjoy one another. For many families, a wilderness adventure puts everyone on the same level. Children and parents are introduced to new environments, people and activities. Sharing these new experiences together allows families to adapt and develop common bonds. Holiday takes a special interest in making sure family members of all ages find a special moment or experience in the trip. Depending on the age of the children and the adventure comfort level, Holiday can recommend a variety of trips for the ultimate vacation. Families with children as young as five can enjoy the winding canyon walls and easy-going pace of the San Juan River in southern Utah, or head north to Idaho’s Salmon River where pine trees and pristine beaches invite cozy camping and laughter-filled days on the river. Another great option, is Holiday’s combination ranch-and-raft trip, where families enjoy two days riding horses and experiencing true ranch living, then jump on a raft for a wet side of the west on the Green River through the magnificent Desolation Canyon. Families with children eight years and older can step up the adventure on intermediate rivers such as Green River in Lodore Canyon, Colorado River through the pre-historic Westwater Canyon and the free-flowing Yampa River in Dinosaur National Monument. Or families might want to head south during the winter to the warm and friendly waters in Baja, Mexico. Here gray whales, sea lions and a plethora of tropical fish welcome families for an amazing ocean experience. All of Holiday’s family trips offer a natural playground where everyone can have fun and learn. Holiday’s guides, experts in river running, history, geology, star-gazing and games, make learning about the natural environment engaging and exciting. A “kid kit” goes along with family trips. Inside is a goodie bag full of games and “fun tools” that help children and adults ease into wilderness play. Hiking, playful water fights and sand castle building are the foundation of outdoor fun, while making sand-cast candles, creating petroglyph symbols and finding and giving “river gifts” extends the wilderness and historic discovery experience. Families are often amazed at the new knowledge and respect for the wilderness they gained on their vacation. Emma Wharton, the Holiday guide that designed many of the kid kit activities, believes that the games play an important role in developing a community on the trip and allowing people to feel comfortable on the trip. In addition, the activities fulfill Holiday’s commitment to creating a unique wilderness experience and educating its guests about the environment. Kids particularly love the games, but parents also join in beach volleyball, discovery hikes, and hackie sack games. Holiday also brings along inflatable kayaks, or “duckies”, on river trips that give guests, young and old, the freedom to explore the river on their own. The day’s activities and fun extend into night, as families gather around for fireside stories, singing and dancing. Besides making sure guests have a fun time, Holiday guides understand safety. All of Holiday’s guides are trained in river rescue and wilderness first aid, though they place emphasis on prevention, taking precautionary measures to avoid accidents. Equipment is checked and re-checked before every trip and the guides take their roles as trip leaders and caretakers very seriously. 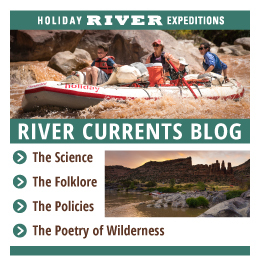 Before a trip, Holiday’s experienced trip planners are happy to answer questions and assist families in preparing for their wilderness river experience. They provide answers to parents concerns and questions about embarking on a river or sea kayaking trip with their family. Though parents are ultimately responsible for their children, Holiday has simple rules, like always wearing life jackets when children are on or near the water, and other suggestions for “getting comfortable” with the water that give parents peace of mind, before “putting on” the river with their children. While guests can find assurance in Holiday’s stringent safety program, they can also choose a trip that fits their adventure comfort level. In order to have a good time, a family has to be comfortable with the adventure they choose to share together. While capable guides, safety, games and dependable equipment are important ingredients in creating the ideal trip, its often the little details that make the trip a “success.” Kid-friendly details like the kid kit and other extras, help make the trip even more enjoyable for the entire family. With a little notice, Holiday can turn river trips into great birthday parties or family reunions. On ranch trips, kid-sized saddles and horses with “kid-sense” open up a whole new world as kids explore the trails winding through aspens and mountain meadows. These simple adaptations seem to make the world of difference between the average family vacation and the memorable, “let’s do it again!” experience. Holiday Expeditions can be reached at 801-266-2087 inside Utah, or toll-free from outside Utah at 1-800-624-6323, or check out Holiday’s web site at www.HolidayExpeditions.com for a complete trip listing.